Every year when back to school and the New Year roll around, I get a little overly excited about school supplies and planners. Even when I was a little kid I loved getting new pens, notebooks, highlighters, and really any other supply you can think of. I feel like Meg Ryan from You've Got Mail, " I would send you a bouquet of newly sharpened pencils if I knew your name and address." As an adult, my most favorite "school supply" is an amazing planner. Every year for the past three years I've had a different planner that I've loved for different reasons. Erin Condren- I actually used this planner for two years. I love how durable this one is. If you're a busy momma and have a million toys, snacks, and etc in your bag this on is perfect. It has a heavy duty laminate front and back so it doesn't easily damage when spilled on or dropped. You can order and customize it online to have your favorite pictures as the cover or for convenience you can now buy them in stores at Staples. The only thing I didn't love with this planner is it didn't have a daily time breakdown. Instead it had boxes for morning afternoon and evening. I like to time block and wasn't able to with this one which is why I stopped using it. Day Designer- This was my 2016 planner and I LOVED the design! They have very trendy covers that almost made it feel like an accessory for me. I love everything about this planner. There's a whole page per weekday with one side dedicated to time blocking and the other for your daily to-do list. At the top you can write your top three things to get done, what you're doing for dinner, what you need to pay, and an inspiring quote for the day. The only reason I didn't re-order it this year was because I found a planner with all this plus a little more. 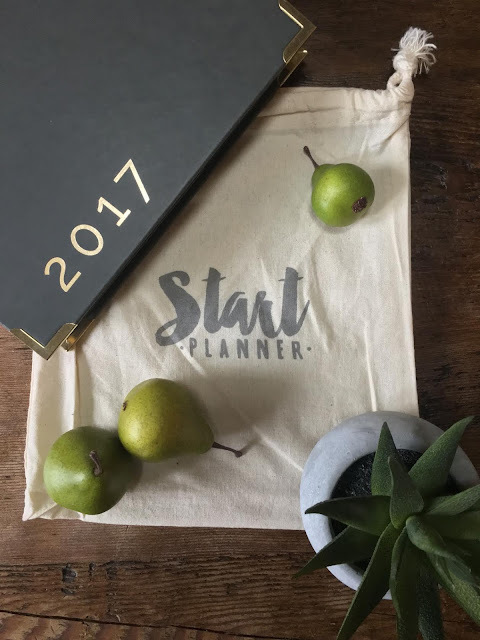 Start Planner- I'm sooooo excited to use this planner this year and have already started jotting things down. So what made me order this one for 2017 was that it had everything the Day Designer did plus some. At the beginning of each month it has a place to jot down your goals for the month and how you're going to hit those goals, a budget sheet to write out your goals and right next to it the actual spending that was done for the month, a grocery list and budget, and much more. A really big thing for me going into my second prep for NPC Bikini is each day it also has a section to track your workouts and water intake. The only thing I wish is that there were more cover designs to choose from. I do like this sleek professional look so I mean there really are no negatives right now. Having a planner makes everything doable for me. I am the type of person who needs to break down my goals in categories to simplify. This makes it easier for me to strategize how to best improve in each area. It's great to have goals and wishes for 2017, but unless you come up with a plan of how to achieve those goals, they don't mean that much. Wife- Prioritize to-do list items. I tend to focus all my energy on things I have going on and sometimes let the things Eric needs done fall through the cracks / Make set plans on Mondays for date nights and not wait until day of. Mom- Plan week ahead to include time for activities. If I wait until the day of, random things always seem to come up, but if I know ahead of time a plan I stick to it better. Religious- Set scripture time right after morning cardio before Tyson wakes up. If I don't do this first thing in the morning, it seems like it's a lot harder to do during the day. Financial- Utilize budget pages in Start planner and update monthly budget on the last Friday of each month. Prep for next month by setting goals around spending. House Keeping-Write out cleaning schedule in planner and stick to it. Blog-Keep a blogging calendar and work on posts in advance. Throughout the year, goals are added and changed to fit our situations. I have so many more ways to improve, but I feel like this is a good starting place for me. I would love to hear some of your favorite planners that you used and what you love about them!